The Olivet Discourse grew out of some questions the talmidim asked when Yeshua told them that the Temple would one day be destroyed. First, they wanted to know when. That answer is not recorded in Matthew but is given in Luke 21:20-24. Second, they asked about the sign of Yeshua’s return or the sign of the end of the age. This is answered in Matthew 24:29-44 which we will get today. It is the period of “Tribulation” that Yeshua described in the Olivet Discourse. At the end of that period, Yeshua will return to the earth, defeat His foes, and establish the promised kingdom during His millennial rule. In this post, we will begin to unpack what Matthew reports as the signs of Yeshua’s return to inaugurate His millennial rule. The phrase of those times signaled that Yeshua was talking specifically about the end times (see similar wording in the Prophets: Isaiah 13:10, 34:4; Jeremiah 3:16, 18; 31:29; Joel 3:1; and Zechariah 8:23). After the time of tribulation, nature itself would experience change. As taught in Romans 8 and 2 Peter 3, the entire universe had become involved in humanity’s fallen predicament; thus, the entire universe will be changed when humanity is changed. The changes in the heavens will be an intended contrast to the pseudo signs and wonders (Matthew 24:24) of the false messiahs. There will be a variety of changes – the sun going dark, the moon not being seen, stars falling, powers in heaven being shaken. These words also recall the words of the prophets (Isaiah 13:10; Joel 2:10-11). Whether these events are to be understood as being primarily literal or primarily figurative, it is clear that these will be earth-shattering events, through which all creation will be radically transformed at the return of Messiah. What Yeshua described here, John saw in his vision of the end times recorded in Revelation: “Then I watched as he broke the sixth seal, and there was a great earthquake, the sun turned black … the full moon became blood-red. The stars fell from heaven … The sky receded like a scroll being rolled up, and every mountain and island was moved from its place.” (Revelation 6:12-14). Some suggest that the sign of the Son of Man is a type of heavenly standard or banner that unfurls in the heavens as Yeshua returns in power and glory, while others understand it to be the arrival of the Son of Man Himself as the sign of the end-time consummation of the age. People will mourn alludes to Zechariah 12:10-12, which centers on the repentance of Jerusalem. Here the scene centers on God’s judgment of His enemies. Everything they have scoffed about will be happening, and it will be too late for them. People will see the Son of Man coming on the clouds of heaven. This most clearly is end-time language that recalls Daniel’s prophecy (see Daniel 7:13-14) and points to Yeshua’s return at the end of the age (see 2 Thessalonians 1:7-10; Revelation 19:11-16). Yeshua will be revealed with power and great glory as the eternal ruler of the Kingdom of God, designated by the Ancient of Days to receive worship and to exercise dominion over the earth and all of its inhabitants. Yeshua’s return will be unmistakable; no one will wonder about His identity. The clouds are pictured as the Son of Man’s royal chariot, bringing Him from heaven to earth in the Second Coming (to the Jews, clouds signified divine presence; see, for example, Exodus 13:21; 19:9; Psalm 97:1-2; Daniel 7:13). Yeshua’s second coming will not be as a humble, human carpenter, but as the powerful, glorious, and divine Son of Man. He will arrive to defeat Satan and judge all people, and there will be no doubt as to His identity. The Son of Man will return from heaven, just as He would leave. Although Yeshua was still with them, the day would soon come when an angel would tell the talmidim, “You Galileans! Why are you standing, staring into space? This Yeshua, who has been taken away from you into heaven, will come back to you in just the same way as you saw him go into heaven.” (Acts 1:11). Upon His return to earth, Yeshua will send His angels out to gather together His chosen people from the four winds (that is, from all across the world, see also Psalm 50:3-5; Isaiah 43:6; 66:18; Jeremiah 32:37; Ezekiel 34:13; 36:24; 37:9; Daniel 7:2; 8:8; 11:4; Zechariah 2:6). This gathering of the chosen ones signifies the triumphant enthronement of the Son of Man, who will be revealed in all His power and glory. 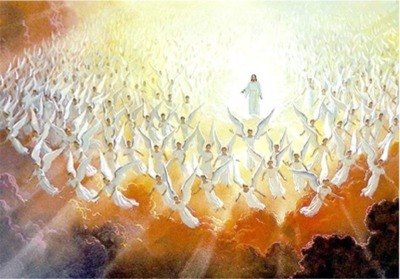 The manifestation of the angels and the gathering of the people will gloriously mark the end of Yeshua’s keeping His divine power and authority a secret. Yeshua’s second coming marks the core of the Believer’s hope. The imagery of the sound of a great shofar would have reminded Matthew’s readers of Isaiah’s prophecy, “on that day a great shofar will be blown” (Isaiah 27:13). The shofar was used in ancient Israel to gather God’s people for religious purposes as well as to call them for battle. This final shofar (see also 1 Corinthians 15:52; 1 Thessalonians 4:16) will signal the gathering of God’s people. When He comes, the whole world will know that Yeshua is Lord, and Believers’ hope and faith will be vindicated. Yeshua will come to gather His saints (the chosen people) and to judge un-Believers. The phrase from one end of heaven to the other combines two Tanakh expressions, found in Deuteronomy 13:7 and 30:4, “Whether near or far, from one end of the land to the other, … even if you have been banished to the most distant land under the heavens, from there the Lord your God will gather you and bring you back.” The wording gives special stress to the concept that none of the chosen people will be overlooked or forgotten. God won’t lose track of anyone. Mark 13:24-26 and Matthew 24:29-31 form the heart of the teaching that Yeshua’s Second Coming to establish His millennial rule which will not occur until after the Tribulation (a time of intense persecution of Believers). Coming persecutions and natural disasters will cause great sorrow in the world. But when Believers see these events happening, they should realize that the return of their Messiah is near and that they can look forward to His reign of justice and peace. Rather than being terrified by what is happening in our world, we should confidently await Yeshua’s return to bring justice and to restore His people. Well-known speaker Tony Campolo has a famous message entitled: “It’s Friday, But Sunday’s Coming.” That’s a great summary of the Believer’s life: we live in a difficult present, but someday Yeshua will come to make everything right, to wipe out sin and grief, to bring an eternity of Shabbats. From the execution stake comes resurrection; from tribulation comes a wonderful Savior. Let Yeshua reign in your heart today. There is no reason to put him off. You have every reason to say, “Yes, Lord, I believe. My life is yours. And every day that I live, come what may, I will trust and serve you.” That decision inaugurates a brand-new relationship with God through Yeshua. In my next post, we will continue to unpack what Yeshua says about His return. 20 “However, when you see Yerushalayim surrounded by armies, then you are to understand that she is about to be destroyed. 21 Those in Y’hudah must escape to the hills, those inside the city must get out, and those in the country must not enter it. 22 For these are the days of vengeance, when everything that has been written in the Tanakh will come true. 23 What a terrible time it will be for pregnant women and nursing mothers! For there will be great distress in the Land and judgment on the people. 24 Some will fall by the edge of the sword, others will be carried into all the countries of the Goyim, and Yerushalayim will be trampled down by the Goyim until the age of the Goyim has run its course.